True love may be hard to find -- but for one group of highly endangered African penguins, it's just a bit easier thanks to the helping hand of a few skilled matchmakers. In this case, they're biologists at the New England Aquarium playing the role of Cupid to a group of African penguins, members of a species which, without a serious baby-boom, may be extinct in less than twenty years. Fortunately, the bird specialists have a magic arrow or two left in their quiver. "We can keep the species alive by making love happen,'' says the aquarium's senior penguin biologist.With so few of the penguins left in the world, finding suitable breeding pairs has posed a bit of challenge. So, penguin experts at the aquarium have been charged with the responsibility of finding each bird its best possible mate, according to a report from The Boston Globe. The staff tries to match penguins that are least likely to be related. The easiest way to do this would be to find mates that do not have a long history in captivity and that bring some new genes to the penguin pool. But because of their diminished numbers, the aquarium no longer removes African penguins from the wild, and ensuring genetic diversity is becoming increasingly challenging. Once a match has been approved, the couple is moved to a more intimate setting downstairs. "Candlelight and romance,'' Hume calls it. If the penguins hit it off -- and they usually do, according to staffers -- that is where they hatch and raise chicks. Aquarium staff speak of the endangered Penguins like characters of a romance novel -- each with their particular tastes. There's "strapping" Ichaboe and "lovely" Spheniscus, who seem to be a match made in heaven. They've been together for one year, reports the Globe, and are still "enthralled with each other." Then there's Plum Pudding and In-Guza, two penguins who paired up on their own accord -- but their romance was not to be. Evidently, their genes were deemed incompatible to produce optimal offspring, so aquarium biologists had to cut their love-affair short. 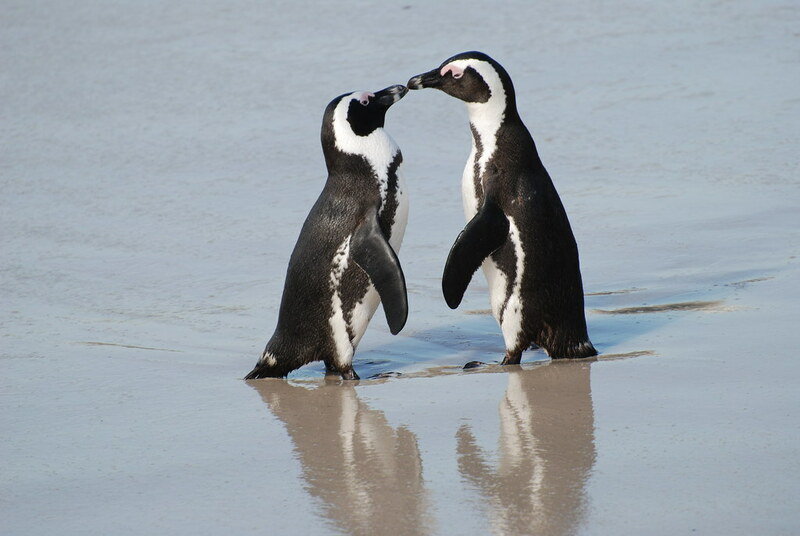 For some of the penguins, romance has come later in life. One bird, named Alfred, has found a mate with a female 27 years his junior. "He's a lucky guy,'' said biologist Andrea Desjardins, one of the penguin matchmakers. In reality though, each of the endangered penguins at the New England Aquarium have a lot to be thankful for, particularly with their devoted team of penguin-relationship experts working so diligently to find them that special someone.